There has been a lot of bellyaching of late about whether or not the National Broadband Network (NBN) will be a viable proposition or not. Certainly, the purported cost of $43b is a lot of money, and when dealing with a sum of that magnitude, a certain level of caution is very obviously quite prudent. Supporters of the network point to the potential flow-on effects to the Australian economy – increased productivity, environmental benefits – the list is almost as limitless as the imagination can muster. Opponents say that the huge price tag is far too much, and that a full cost-benefits analysis needs to be performed before we earmark the funding for the project. Others say the analysis is not needed. These are strong arguments either way. For myself, the biggest thing missing from the debate is any simple, rational exploration of what the numbers might be. So I’m going to give it a bash! 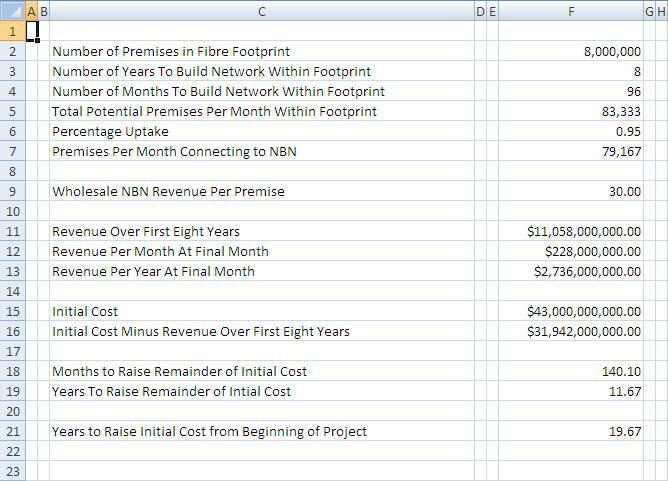 The starting numbers look like this: approximately eight million premises to lie within the fibre footprint of the network over eight years – (or ninety six months) – and that is growth of about 83,333 premises within the footprint per month. 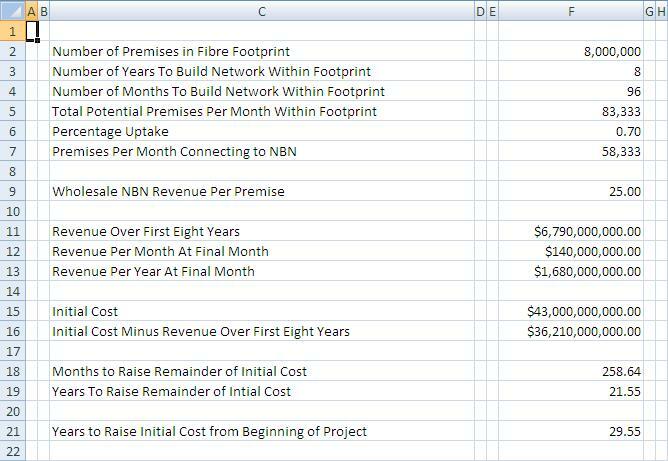 Assuming an uptake of around 70% of premises within the fibre footprint opting to use the NBN, the subscriber base will grow by around 58,333 every single month across the eight year rollout. Assuming rough parity with current wholesale access pricing for our existing ADSL/ADSL2+ network(s) of around $25.00 – (about what is expected) – the revenue base grows by $1,458,333 every month. 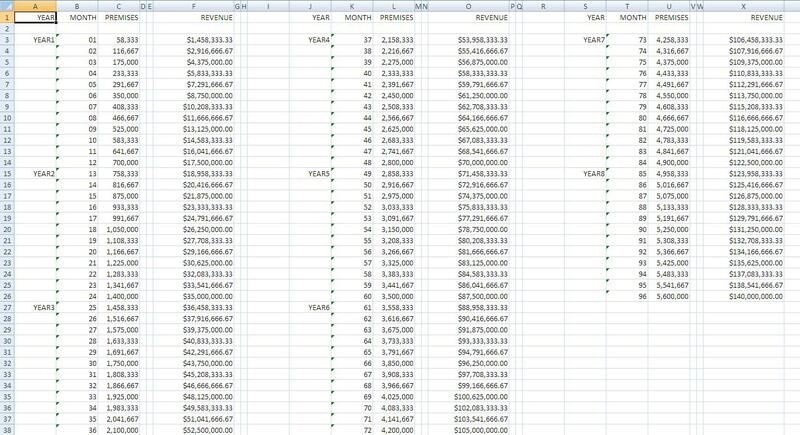 Presuming that the numbers are maintained across the eight year life of the rollout, the total number of subscribers connected in the 96th month will be 5,600,000, generating $140,000,000 of revenue per calendar month. Or if you like, $1,680,000,000 per year. Yes, that is 1.68 BILLION dollars. Ever wondered why Telstra delivers such massive profits – ($3.94b in the year to June 30, 2010 for example) – year after year after year? Adding the monthly revenues across the ninety six months, at the end of the eight year rollout, there will already have been $6.79b of revenue raised, just because the network existed and was raising revenue from customers. 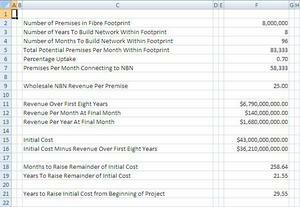 Of course, I can’t factor operational costs into the numbers – as that is something there is no information about, and I doubt NBN Co themselves can do that yet – so this is only a revenue figure, not a profit figure. It is however reasonable to suggest that whatever operational profit comes out of that $6.79b revenue, that a certain amount of that will have been turned back to offset the cost of the build throughout the eight years, reducing the $43b price tag. Again, not allowing for costs, subtracting the $6.79b from the $43b means we have $36.21b still to be “recovered”. Since – presuming the wholesale cost to supply each premise doesn’t change (unlikely) – the network would be raising $1.68b per year, it would take a little over twenty-one-and-a-half more years to recover the $43b. Any increase in the wholesale per-premise cost will obviously shorten the time frames. What of the costs? Well, that’s a fair point, but are those costs offset by the benefit of having the NBN in place over those almost 30 years? Quite possibly, and in my opinion, absolutely. It does seem that uptake numbers will be very important, so lets take another look at the numbers. Since the copper network will be decommissioned, every premise within the NBN fibre footprint that currently has any style of active xDSL connection – or even just a POTS line – provisioned to it, will need to have that connection transferred onto the NBN. The copper network will be gone, so there is no choice. In that respect, uptake numbers will actually be much much closer to 100% than the 70% used in my example above. Further, given that every NBN connection to a premise will be able to carry more than one service across it – (as an example, you might have one for internet connectivity, one for a POTS connection, and one for subscription television) – actual uptake might be more than 100%. That’s a story for another day however. For argument sake, lets change our figures to 95% uptake, and a slight increase in monthly wholesale cost per premise to $30.00. The new numbers look like this: approximately eight million premises to lie within the footprint of the network over eight years / ninety six months – that is growth of about 83,333 premises within the footprint per month. An uptake of around 95% of premises within the footprint opting to use the NBN, the subscriber base will now grow by around 79,167 every single month across the eight year rollout, with the revenue base growing by $2,375,000 every month. The total number of subscribers connected in the 96th month will be 7,600,000, generating $228,000,000 of revenue per calendar month, or $2.736b per year. The network will have already generated $11.058b of revenue, bringing the remainder to be recouped down to $31.942b. At $2.736b per year, it will now take only a little over eleven-and-a-half years to get the raised revenue up to $43b – a saving of TEN WHOLE YEARS over the earlier example. Theoretically the costs to run the network won’t change from the first example, because the network will be physically the same. 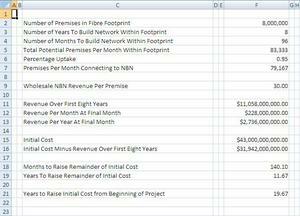 Even with relatively poor uptake levels, the NBN will be able to generate annual revenue measured in the billions. Add to that the economic benefits of just having the network – and importantly, having this infrastructure before our trading partners – and the benefits of spending this money on the NBN start to look mindblowing. And I didn’t need convincing before I ran these numbers! By no means have I just done a full cost-benefits analysis, and admittedly I have made a number of assumptions in tabulating my numbers. Remember though, that anyone trying to analyse this proposal needs to make similar assumptions. However even my cursory look at the potential seems to suggest that a lot of the FUD about massive financial blackholes that are out there right now are decidedly shaky.